"Personalized Grandmother's Rings in 14K Gold, Triple Bands"
Design a special ring for grandma stamped with names of children and/or grandchildren. The unique family ring will be one she will cherish for a lifetime! have the gift wrapped in our signature lavender and rosebud packaging! The listed price is for a size 4. The price will increase if you order a larger size. 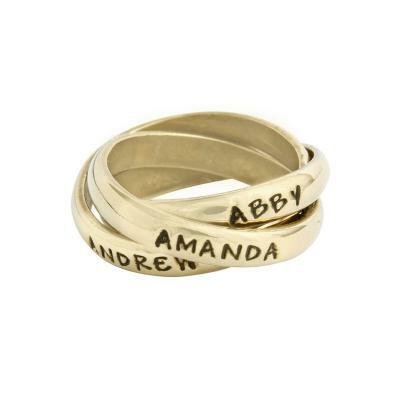 Personalized mother's name rings are now in gold! This name ring is perfect for grandmother's with three grandchildren. The overlapping custom stamped bands create a beautiful ring which is subtle and meaningful. PLEASE NOTE: These rings take about 3 weeks in production. If you need the ring faster, please call us at 817.926.6336 and see if we can accomodate the rush and the cost involved. Dimensions: The 14K gold bands are approx 3mm wide and can be stamped with up to 9 characters/spaces. When putting on a triple ring, you must first line up all the names in the correct orientation then roll the ring down your finger. A flipped band will make the ring a whole size smaller. Do not force a ring onto your finger. We only use 14k gold. This gift is wrapped in our signature lavender and rosebud packaging. So whether it is a gift for you or someone else, the surprise you get when you open the box will make you smile!